There are three main components in the Electrical Generator: The Stator, the Rotor, and the Brush Compartment. A Generator (where mechanical energy is converted into electrical energy) makes use of Faraday's Law. There are two components that make up the synchronous generator at Aghada and these are namely the Rotor and the Stator. The Rotor is a revolving DC magnetic field magnetised by a direct current known as an excitation current. The Stator is made up of a stationary armature holding three wire coils connected in series and arranged in phase so as to obtain a terminal voltage of 21kV. The armature winding is housed within a slotted laminated steel core to reduce energy losses. The relationship between magnetism and electrical current was discovered 1819. It showed that if an electric current flowed through a conductor then a magnetic field was produced around that conductor. 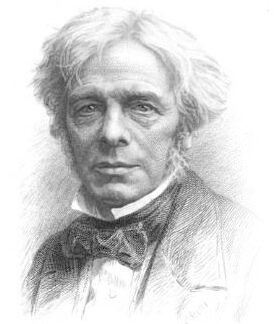 This idea was further built upon by Michael Faraday (pictured) who established that if a conductor is moved through a magnetic field then an electrical voltage is induced in the conductor. The magnitude of this generated voltage is directly proportional to the strength of the magnetic field and the rate at which the conductor crosses the magnetic field. Faraday’s Law of Induction states that any change in the magnetic environment of a coil of wire will cause a voltage to be 'induced' within that coil. This may be achieved by changing the strength of the magnetic field, or by moving/rotating the magnet or the coil relative to each other. The Generator shaft in Aghada is coupled (connected) at all times to the Gas Turbine, and when Aghada is operating at full capacity the Steam Turbine is also clutched to the generator shaft. This mechanical (rotational) energy once converted into electrical energy is exported to the National Grid via a Transformer.